INDUSTRY.co.id - Sentul - Indonesian Media Association (SMSI) again made a noise. This time, the largest cyber media organization in the country held Indonesian Digital Safari. According to the Secretary General of SMSI, Firdaus, Digital Safari is an SMSI hospitality road show to a number of institutions that use digital content in joint efforts to educate and prosper the nation. "We pick up the ball. We go to them one by one, discuss, work together, put forward the digital spirit, keep people from hoaxes," said Secretary General Firdaus, Thursday (05/09/2018). Firdaus explained, the headquarters of the Counter Terrorism Agency (BNPT) in the Sentul region, West Java, became the first destination for SMSI Digital Safari. 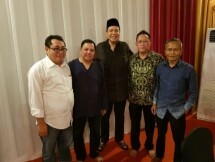 In addition to Secretary General Firdaus, it was also seen in the Digital Safari Chair of the Mursyid Sonsang Organization Division and the Director of News Reporting on Ramon Damora. The three officials of the SMSI were welcomed by the Deputy I in the Field of Prevention, Protection and Deradicalization of BNPT Maj. Gen. Abdul Rahman Kadir. He said, the BNPT had always opened itself wide to parties who wanted to work together with the BNPT in an effort to build digital content to counter the spread of radicalism. Especially the mass media. 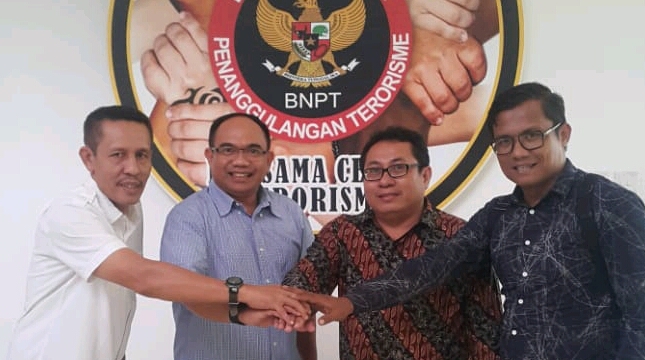 Institutionally, explained Deputy Abdul Rahman, the BNPT cannot walk alone in carrying out counter-narrative and counter-propaganda agendas blocking the rapid flow of radicalism dissemination to almost all lines of nation-state life. "Their system is very sophisticated. Even the world of campus as an intellectual base they have almost mastered," he said. Abdul Rahman hopes, as a large cyber media organization that has 400 members of Indonesian online media companies, SMSI can become a media-partner of BNPT. "Help us," he said.